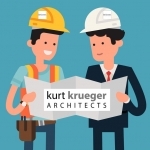 Poetic and Practical: What it Means to be an Architect-Builder - Kurt Krueger Architects, Inc. The first meeting with a client starts with questions. I ask, “How are you going to interact with the space?” and “How can I enhance your lifestyle with an indoor-outdoor feel?” Perhaps they want a *wow* factor that their friends will be impressed by, or they just want to enjoy a glass of wine in solitude by the pool. It depends on the client. At the beginning, these feelings are much more important than the technical details. Capturing the client’s goals and understanding them are the first input to the design. As a design-build firm we don’t do cookie-cutter, one-size-fits-all design—our unique designs not only accentuate the desires of our clients, but elevate them. This is the essence of what it means to be an Architect-Builder: uncovering what will make our clients feel like they’re living in their dream home. The process evolves like this: we have a 90% idea of what something is going to be during the design phase and a 10% window where we can experiment. I wouldn’t have it any other way. Improvising on site is part of my creative process. For me, the evolution never stops. We learn so many things during the construction; things that were unknowable at the onset and require flexibility and smart solutions. When an architect is separated from construction, often by two or three layers, translating and conveying every detail to contractors has a negative impact. When things ‘come up,’ our design-build team rises to the occasion. Much of my day is spent out on the construction site. It’s so important to maintain a high degree of involvement at this phase. I don’t just hope the contractor makes the right decision—I know that ‘I’ will. To me, the construction side is the most exciting because that’s when you see everything come together. It’s rewarding to find that what you capture on paper is flowing together in real life. This is also a reassuring step for our clients; the trust they’ve put in us pays off. They see the level of precision we bring to every project. With our reputation growing and spreading, our clients now expect nothing less from us. There’s a misconception that design and construction aren’t connected, but actually they flow from one another, back and forth. As a design-build firm, our purpose is to blend the beauty of architecture with the practicality of construction. We are marrying the design style and needs for the home with quality craftsmanship. Sometimes architects gravitate toward theory and don’t always grasp the practical side of how design becomes concrete and steel, wood and glass. In our office, we blend the practical and the theoretical early on. Because we are architect-led, we excel at figuring out new ways to create dream homes.